You know those mornings when you’re running late? The mornings that stretch to afternoon and really never end at all? That was yesterday. Throw in some light housekeeping and assorted other chores and errands and my typical uniform of coat and tie jsut didn’t make sense. So I took a page from The Architect’s book and wore a nice polo collar shirt. This one is ribbed silk. Khakis are workhorses, these are flat fronted and slim cut. The Tod’s driving mocs — Gommino’s — are just plain comfortable, especially in suede which allowed me to go sockless into the 80ºF day. But, when I stepped beyond the confines of the Manse, a bit of effort was required. This is Richmond where you will run into someone you know. I rant about dressing better than you have to, And then there are my own standards to consider. (Read: vanity.) So, to pick up the pop/bubble/fizz at Trader Joe’s, on went the tonal sportcoat and in went the blue bordered pocketsquare to pick up the line in the coat and the shirt. Casual doesn’t have to mean mundane. With some knowledge aforethought, you can inject a bit of effortless elegance into the everyday. Consider stepping up your casual Friday or weekend attire, just because you can. 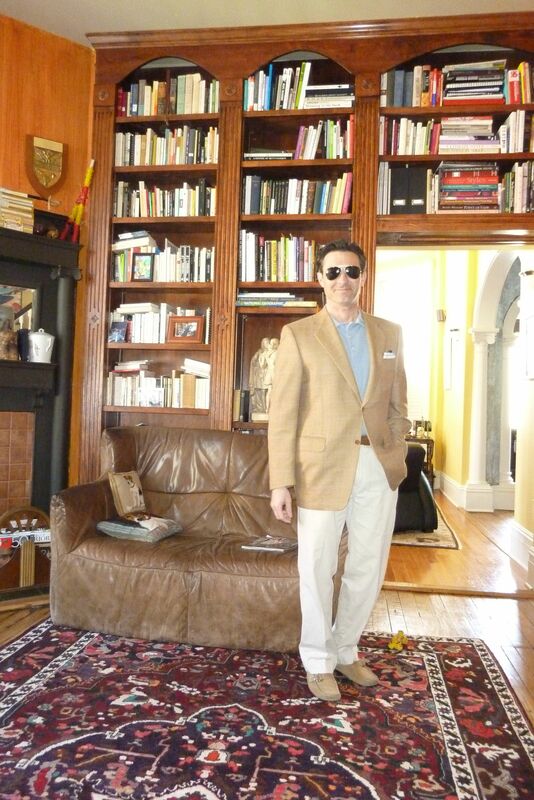 This entry was posted in Elegantology and tagged elegantlology, Gomminos, The Architect, Tod's, Trader Joe's. Bookmark the permalink. Chris I am in complete agreement. Casual can be stylish and pulled together. Art Giveaway is up on my site so come and join in! I love Tod’s. Need a new pair for spring, methinks! You look fabulous, the way casual should be done! You’re in Richmond?! We should lunch. Cashmere, in a jewel toned suede I think! Ms. Lemontree, welcome and thank you. I’ve added you to the blogroll. You had me at your tagline! So nice to have met you. Karena, I’m starting to believe that some folks are just plain lazy. It isn’t that difficult! Hello Anita and welcome! I’m thinking of starting a salon at Can-Can. Apparently, there are a few of us around town! I really must dress better. Spring is here and I am going to try harder. Dear Aesthete! Use that marvelous eye of yours. An aesthete is a natural good dresser. I know you’re well-turned out regardless. So dressing stylishly while casual is the best of subjects… I am strangely more interested in the two yellow and red batons up on your mantle. I very much want them to be relics from a bull fight but would much rather have you tell me what they really are. I always love how Spring can add a lightness in our step. I love neutrals and casual elegance. You look marvelous. There’s simply no competition, I dare say, in matching your sartorial splendor. Mrs. PvE, thank you. Spring does that doesn’t it? eA, we are birds of a feather. Brohammas, you are entirely correct. They are piques (if that’s how you spell it.) The sword lies across the empty cigar boxes. Kathy, thank you. the makeover is extending to the Manse too! Agneta, welcome and thank you. Snazzy looking site you’ve got! “Mellow Yellow” is a great way to start a morning. I think I may have just found my male, style defending counter part. Dear Mr.Elegantologist, although my blog name may be dreadfully cryptic, it seems that you and I are on similar missions – Saving the world from sartorial mediocrity! Your casual look is the perfect balance of comfort and style; proving that the two are not mutually exclusive but indeed can be made to work. So pleased to have found you and shall now be adding you to my list of daily reads, if for no other reason than to keep heart that there *are* still men who know how to dress! Dear SKM, welcome! That’s quite a stylish blogsite you’ve got going! And yes, we find ourselves on the same path. Thanks for the vote of confidence and the kind comments!